Our Mission is Growing Disciples of Jesus Christ. We hope that you will find connection with God and a warm welcome from our people. To learn more about us, read the overviews below and browse our website to learn more about our ministries and what God is doing among us. God bless you always! What is St. Peter & St. Paul like? St. Peter & St. Paul is an Episcopal Church, often described as a combination of both catholic and protestant heritage. We are similar in worship style to Lutheran, Catholic, Methodist and other churches with a regular pattern of Bible readings, prayers and hymns. We are reverent, yet friendly. We stay relevant to daily lives while rooted in tradition. Some folks come in jeans, some wear ties, all are welcome. We focus less on politics and more on Christian living. We honor the Bible as the Word of God, and we strive to put Jesus Christ at the center of who we are and all we do. Our weekend services are communion services on Saturday at 5:30 PM (a small service without music, gathering 40-50 people), Sunday at 8:00 AM (with hymns, gathering 60-70 people), and Sunday at 10:30 AM (with choirs, gathering 200-300 people depending on the season). For more information about our worship services, click here. We welcome guests of all ages and stations in life to participate in worship and ministry. The ministry of the church is done by all the people, and there are a range of ministries to help you grow as a disciple of Jesus Christ. We have excellent programs for Children and Youth, numerous Bible Studies and classes for adults, and a variety of ways to serve Christ in the world. Our Pastoral Care ministries provide support in practical, spiritual and interpersonal ways. While we welcome you to join us as a member, you are welcome to participate as a guest. Please let us know how we can support you in your journey. The Episcopal Church is part of the worldwide Anglican Communion. We hold the orthodox Christian faith in the one God: Father, Son and Holy Spirit, as revealed in Holy Scriptures, declared in the creeds and worshipped by millions of faithful Christians over two millennia. We describe Jesus Christ as our Lord and Savior because he is God in human flesh, and he offers us freedom from our sins and new life in him that will never end (see more about Jesus here). Anglicans trace their heritage to the Church of England. 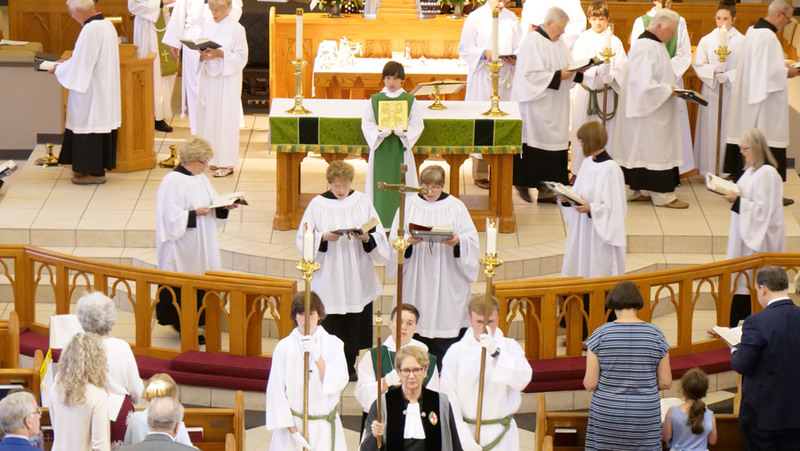 Anglicans are often described as a combination of both catholic and protestant heritage. We have bishops, priests and deacons, we believe in the importance of the sacraments such as Baptism and Communion, and our theological foundations are the Bible and the ancient creeds of the church (the Apostle’s Creed and the Nicene Creed). However, priests can marry, the church is less hierarchical than the Roman Catholic Church (rather more built on councils, including governance shared with lay people), the saints rarely figure into our prayers, and we have very little mandatory church teaching outside of that found in Holy Scripture. Anglicans develop their theology based upon scripture, tradition and reason. Holy Scripture is authoritative in our faith and practice, and the basis of our doctrine. Tradition is the means by which we stay connected with the church over the centuries since the time of the apostles. Tradition helps us to interpret scriptures in keeping with the way the early church did—especially the early councils of the church that produced the creeds. Reason helps us to understand scripture and tradition, both because reason comes from our God-given capacities to learn and understand, and because our experience of the Holy Spirit guides us as we seek the mind and heart of God on questions that we face in contemporary life. Anglicans are not individualistic in our faith; we believe that the Holy Spirit is given to the community of the church, affirming scripture and tradition. Therefore, dialog and seeking God’s will for us together, as a community built by Word and Sacrament, is a key part of our identity. All denominations have their controversies, and the Episcopal Church is no exception. The tough questions come for us in the tensions between the authority of scripture, the precedent of tradition and the engagement with the contemporary world through reason. As an Anglican church, St. Peter & St. Paul seeks to be open to the voice of the Holy Spirit, while faithful to what God has revealed. We stay relevant to daily lives while rooted in tradition. We focus less on politics and more on Christian living. We honor the Bible as the Word of God, and we strive to put Jesus Christ at the center of who we are and all we do. 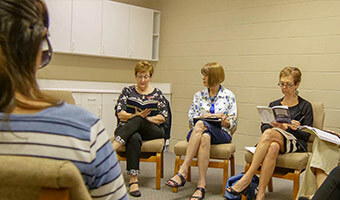 If you have questions about our approach to the faith, please contact our clergy (Click Here). The Episcopal Church uses the “Book of Common Prayer” for its worship and theology [click here for a link to an online BCP]. This prayer book is derived from the English prayer book tradition, and continues the heritage of beautiful language and a thoughtful approach to worship. We were founded on June 29, 1981. The first gathering of prospective parishioners took place at the home of our first vicar, The Rev. Louis Tonsmeire. The rapidly growing congregation quickly found larger accommodations and was able to build a church on Johnson Ferry Road . The first service in our building, now the parish hall, was in May 1983. Initially a mission congregation, we gratefully received financial assistance from the Diocese of Atlanta, the Cathedral of St. Philip, and Holy Innocents Episcopal Church. We became self-supporting in January 1985, and Father Tonsmeire became our first rector during a period of rapid growth, not only of the church, but also of the surrounding area. As Cobb County experienced dramatic growth and corporate transitions, the parish changed rapidly as well. The Rev. Louis Tonsmeire resigned in 1989, and our second rector, The Rev. Jerry Hardy, served from 1990 – 1992. The Rev. Aaron Uitti became our third rector in October 1993, over-seeing a period of tremendous growth during the next six years. In 1997 we completed a new worship space, a new nursery area, Sunday School classrooms, kitchen, and memorial garden. The former worship space became a parish hall and kitchen. The Rev. Aaron Uitti retired in March 2007 after fourteen years. The Rev. Dr. Robert Certain was called in April 2007 as interim rector, and he became rector in September 2008 until his retirement from parish ministry in October 2012. During this time, ministries began to organize more effectively for a larger church, and a second capital campaign paid off a longstanding debt from our building project in the 1997. The Rev. Thomas C. Pumphrey became our fifth rector in October of 2013. We have also been well served by other clergy along the way, including our parishioner, The Rt. Rev. Don A. Wimberly, retired bishop of Texas, and our current Associate Rector, The Rev. Elisa Harres, who joined us in 2008. St. Peter & St. Paul has seen ebb and flow of the church in response to changes in leadership, and changes in Cobb County and the Episcopal Church. Worship of God has remained our focus, providing a place for families and people of all ages to grow as disciples of Jesus Christ. We also continue a long history of serving Christ in the world, with hands-on involvement in numerous local ministries to those in need. In recent years, our leadership has focused on Youth, Music and Children, investing in full time staff for Youth and Music, and increasing staff resources for Children’s Ministry. We are also growing in leadership development to provide a depth of faithful leadership for the future. Looking ahead, we are developing several Evangelism initiatives to provide an intentional and personal invitation and welcome, and to help people get connected with God and with each other in the church. Come be part of the next chapter of our history as we pursue our mission: Growing Disciples of Jesus Christ.